Unique engagement ring with a side stone pattern that you probably haven't seen before! 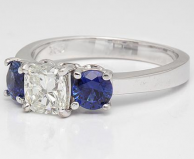 The side stones in this ring are "graduated", which means that the outer side stones are smallest, and they get bigger as they come together at the center diamond. 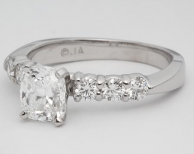 The band is 14k white gold and you can set almost any diamond size and shape in the center. 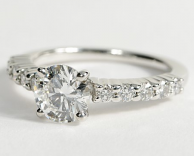 5 round diamonds sit on either side of your center diamond, glimmering in the light and showcasing your center stone. 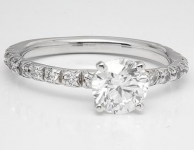 This 14k white gold engagement ring can be set with any shape and size diamond. 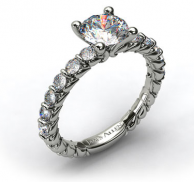 Ornate engagement ring with sidestones and intricate detailing all the way around. 8 sidestones float on either side of your center diamond to provide additional sparkle without taking the spotlight away from the center stone. 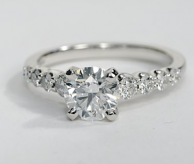 This 18k white gold setting can accommodate a diamond of any shape and most shapes.